Clean-power innovator LEHR, LLC today unveiled its new 25 hp Propane Outboard to the worldwide press and the boating public at the 2015 Miami International Boat Show, bringing clean, efficient outboard power to a new range of boats including pontoon boats, fiberglass and inflatable yacht tenders, RIBs, aluminum fishing boats, small center console skiffs and other vessels. This 2-cylinder, 498cc SOHC 4-Stroke outboard is LEHR’s most powerful engine to date and the largest factory propane outboard available. Its launch introduces a new class of boats — and boaters — to the many advantages of propane power. These advantages include easy electric or pull starting (with no troublesome choking or priming), maximum acceleration/performance with 110-octane fuel and superior efficiency that delivers more miles (and boating fun) between fuel stops. Along with all this, boaters get the satisfaction of fueling their on-water excitement with an engine that produces zero evaporative emissions and no marine pollutants. “We’re very excited about our new 25 hp model, and what its introduction will mean to the boating industry worldwide,” said Capt. Bernardo Herzer, CEO and founder of LEHR. “As we continue to expand our line, more boaters will experience the benefits of propane power and will realize that great performance and doing great things for the environment can go hand in hand,” added Herzer. According to Herzer, an innovative Liquid Draw fueling system is key to the LEHR 25’s performance. Specialized liquid draw tanks work in concert with an innovative heated evaporation system that rapidly changes the state of the fuel from liquid to gas. This unique fuel delivery system, which includes rugged stainless steel fuel lines, prevents the fuel from freezing and ensures a steady, precise supply of vaporized propane to fuel this powerful engine. Under its sleek cowl, the LEHR 25 is packed with innovative features, including an optional internal, fully sealed Lithium Iron battery available on Electric Start models. LEHR is the only outboard manufacturer to offer this breakthrough, providing fast, reliable starting while eliminating the need for heavy, potentially hazardous lead-acid batteries. In addition, having this lightweight (>2 pounds) battery integrated into the engine simplifies rigging and saves valuable deck space, whether it’s an inflatable tender, tiller-steered fishing boat or fleet of rental pontoon boats. LEHR’s optional Lithium Iron battery offers several important performance and reliability advantages over traditional batteries, as well. This battery can hold an unloaded charge for an entire year without compromising service life, its overall lifespan is up to twice that of lead-acid batteries, and the extremely low discharge rate make it ideal for seasonal use. Continuously recharged by the LEHR 25’s 6-amp/80 watt alternator, this battery ensures instant starts in all types of conditions. This innovation is also offered on the company’s portable 9.9 and 15 hp outboards. To accommodate a range of boat styles and applications, the LEHR 25 is available in 15” (S) and 20” (L) shaft lengths with various options for Manual/Electric Starting, Tiller/Remote control and Power Tilt and Trim. The LEHR 25 is offered with optional 22-pound (5.3 gallon) or 31-pound (7.5 gallon) Liquid Draw Composite Tanks designed for marine use. These lightweight tanks feature an opaque design that allows boaters to see at a glance the amount of fuel inside. Considering the fuel-efficient characteristics of the LEHR 25 — recent testing showed consumption rates of 1.1 gal/hr at 3,000 rpm and 2.5 gal/hr at 5,000 rpm — boaters will have plenty of time to explore, fish or cruise between fill-ups. 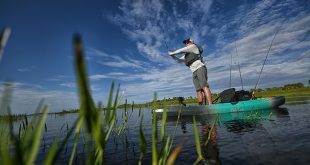 Several other tank options are also available, including aluminum and steel tank options in a range of sizes to suit the needs of a variety of boats. Propane outboards like don’t just run stronger and up to 50 times cleaner, they are easier and less expensive to maintain, as well. Propane combusts completely and cleanly, reducing engine oil deposits and extending scheduled maintenance intervals. The lubricating properties of engine oil are further enhanced because propane, unlike gasoline, does not act as a solvent. With no gasoline to gum up the carburetor or fuel lines, there is no need to run the motor dry at the end of the day. Nor is there any need to winterize the outboard before long periods of storage. Affordable propane fuel is produced in America, widely available and, perhaps most importantly, weighs substantially less than gasoline. Like every LEHR outboard, the new LEHR 25 is engineered and built for long-term performance and reliability in the harsh marine environment, with stainless steel drive, shift and prop shafts and corrosion-resistant materials throughout. All LEHR outboards are backed by the company’s 3-Year Warranty, which includes the optional internal Lithium Iron battery. 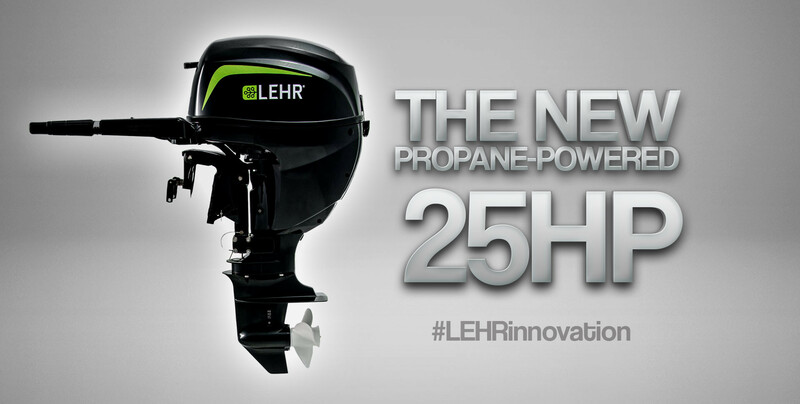 The new LEHR 25 Propane Outboard is scheduled for public availability beginning May 2015 through West Marine retail centers and other LEHR outboard dealers across the U.S. and Canada. MSRP for this new outboard will begin at $4,295.